Feel bored with Minecraft recently? Then, visit Play Minecraft! Here, we offer a pack of Minecraft games free so you do not miss any. These mini-games have brought the pixelated world to you, nearly. You, from now on, can play all kinds of quirky versions directly in your browser. Whether the game is in 3D visual style or 2D simple graphics, you can savor freely, without creating account. We guarantee you'll never look at Minecraft the same way again! Get ready with Minecraft games free? Discover new ways to have fun with the characters in the game or continue with the classic if it's what you really like. With Mine Blocks Online, players can create their own constructions, explore the territory and get resources they can use to be improving gradually. They should get metals to improve their weapons and armor to defend against creatures and other players also get food to survive in this world. For the subject of food are peaceful animals such as chickens, pigs, sheep, etc. of which the user can get both food and resources they provide. Your only mission is to survive in this hostile world, working during the day collecting resources to protect you on the night of the terrible creatures that come out at sunset. In case you want to put your defense skills on test, give Minecraft Tower Defense Final a shot. For fans of the massive Minecraft game, try Minecraft Creeper Diamond Adventure 3, to get through lava caverns, gather gems and exit the game. 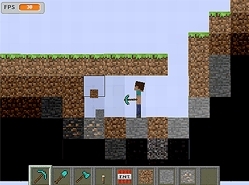 With the Minecraft game play pack, all the games are free including Creep Craft, Minecraft Scene Creator, Minecraft Quiz V1.47, etc. The only limit is your own imagination! Minecraft is never the same game twice. Enjoy!